The Final Fantasy universe is packed with compelling characters and incredible storylines. In this book, you'll take a fascinating look at the deeper issues that Final Fantasy forces players to think about while trying to battle their way to the next level, such as: Does Cloud really exist (or should we really care)? Is Kefka really insane? Are Moogles part of a socialist conspiracy? Does the end of the game justify the means? 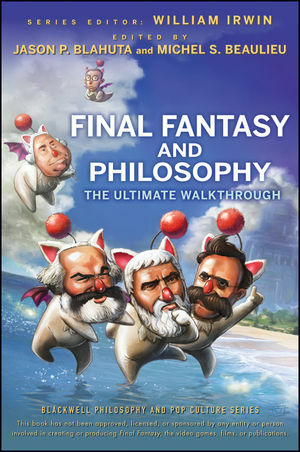 As Mages, Moogles, fiends, and Kefka are mashed together with the likes of Machiavelli, Marx, Foucault, and Kafka, you'll delve into crucial topics such as madness, nihilism, environmental ethics, Shintoism, the purpose of life, and much more. Guaranteed to add a new dimension to your understanding of the Final Fantasy universe, this book is the ultimate companion to the ultimate video-game series. Jason P. Blahuta is an associate professor of philosophy at Lakehead University and has contributed to Battlestar Galactica and Philosophy and Terminator and Philosophy. Michel S. Beaulieu is an assistant professor of history at Lakehead University. William Irwin is a professor of philosophy at King's College. He originated the philosophy and popular culture genre of books as coeditor of the bestselling The Simpsons and Philosophy and has overseen recent titles including Batman and Philosophy, House and Philosophy, and Watchmen and Philosophy. PART ONE: BASIC CONTROLS AND UNDERSTANDING YOUR CHARACTERS. 1 The Spiky-Haired Mercenary vs. the French Narrative Theorist: Final Fantasy VII and the Writerly Text (Benjamin Chandler). 2 Kefka, Nietzsche, Foucault: Madness and Nihilism in Final Fantasy VI (Kylie Prymus). 3 Judging the Art of Video Games: Hume and the Standard of Taste (Alex Nuttall). PART TWO: PLAYING THE GAME—BUT WHAT IF IT’S NOT A GAME? 4 The Lifestream, Mako, and Gaia (Jay Foster). 5 Gaia and Environmental Ethics in The Spirits Within (Jason P. Blahuta). 6 Objectification of Conscious Life Forms in Final Fantasy (Robert Arp and Sarah Fisk). PART THREE: ABILITIES YOU NEVER KNEW YOU HAD. 7 Final Fantasy and the Purpose of Life (Greg Littmann). 8 The Four Warriors of Light Saved the World, but They Don’t Deserve Our Thanks (Nicolas Michaud). PART FOUR: SIDE QUESTS OF THE ENLIGHTENED. 9 Shinto and Alien Influences in Final Fantasy VII (Jonah Mitropoulos). 10 Kupo for Karl and the Materialist Conception of History (Michel S. Beaulieu). 11 Sin, Otherworldliness, and the Downside to Hope (David Hahn). PART FIVE: OTHER WAYS TO ENJOY THE GAME SO IT NEVER ENDS. 12 Human, All Too Human: Cloud’s Existential Quest for Authenticity (Christopher R. Wood). 13 Is the Fear of Stopping Justified? (Kevin Fitzpatrick). 14 What’s in a Name? Cid, Cloud, and How Names Refer (Andrew Russo and Jason Southworth).